A report from the Center or Macroeconomic Research of Russia's largest state-run bank Sberbank said that the euro is overvalued in general. It does not go about the European currency in the south of Europe, the Vedomosti newspaper said. In Greece, the euro is overvalued most among 22 developed countries that were included in the review. The Greek euro is thus most expensive, the experts concluded after they analyzed the real effective courses of the currencies and their equilibrium value. In particular, the fair rate of the euro for Greece would make up $0.97. However, the country uses the euro that costs $1.34. The currencies of Greece, Portugal and Spain need to be lowered by 19.5, 17.8 and 15.5 percent respectively. 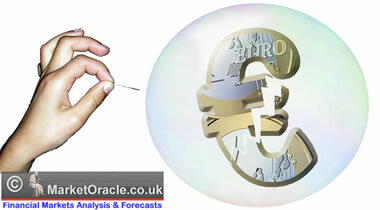 The Italian euro is 6.1% overestimated; in Ireland, the currency is overvalued by 9.7%. Greece, Spain, Italy, Ireland and Portugal are in the crisis zone. However, these countries are virtually deprived of the currency regulation tools - devaluation in this case. Instead, they have to cut budget spending, which triggers protests on the part of the population. If the governments of those countries could gradually devalue their currency, they would reach the desired results a lot easier. As for Germany and France, the euro in these countries is undervalued by approximately 5%. This contributes to export success of the German industry. In Belgium, the joint European currency is 6.8% undervalued. If the rates were equal, today's euro would cost 1.23 of the Greek euro and 0.92 of the German euro, the Vesomosti wrote. According to the above-mentioned report, the British pound and the Swiss frank are undervalued most (15%). It is also very important that the countries that preserved currency independence, are much more stable than those that did not. Sweden is Europe's most successful borrower, the experts concluded. The financial system of the country looks stable. On December 1, Standard & Poor's raised the ratings of Sweden's four largest banks from A to A+. In 2011, Sweden managed to cut its public debt to 36% of the GDP vs. 40.2% in 2007. At the same time, the average indicator of the public debt-GDP correlation in the Eurozone makes up 88%. As a result, the yield of Swedish securities lags 40 basic points behind the most reliable debt securities in the Eurozone - Germany's. Sweden has become a quiet harbor, and the country may benefit from it in the nearest future already. Investors know where they can "run" in case the state of affairs in the Eurozone takes a dangerous turn. It is worthy of note that several European countries may introduce their own national currencies to solve the debt problems. The euro as the joint currency will be preserved in the "core" - Germany, France, Belgium, Holland and several others.